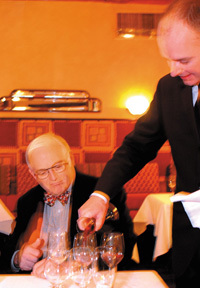 Roman Weil selects one of three pinot noir–filled glasses. Pressing its base against the white tablecloth, the V. Duane Rath professor of accounting in the GSB moves the glass in quick, tiny circles, swishing the wine. He lifts the glass and dips his nose into it, deeply inhaling. He sips, then lightly slurps, swallows, and clicks his tongue. After a palate-cleansing drink of water, he does the same with the other two glasses. 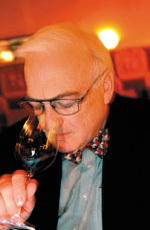 Weil is repeating an experiment he published in the May 2001 statistical magazine Chance: two of the three glasses contain the same wine, a 1998 Oregon reserve rated excellent in Robert M. Parker Jr.’s Wine Advocate vintage guide, and one contains a 1995 nonreserve rated average. Tasters must decide which glasses hold the same wine and which is considered better. Weil guesses wrong, as do two of the three other diners at his Les Nomades table in downtown Chicago, including the Mobil four-star restaurant’s co-owner, Mary Beth Liccioni, whose “refined palate,” Weil says, makes her a connoisseur. The 241 GSB students, alumni, and companions who tasted 593 wines for Weil’s Chance study also guessed poorly—only slightly better than random chance would predict. That’s because today’s winemakers produce “wine of such uniform high quality,” Weil says, that vintage charts have become useless.